Life, Doctor Who & Combom: Doctor Who Missing Episodes Details Leaked? Doctor Who Missing Episodes Details Leaked? We're just 5 hours away from midnight but we've finally got something that we could call concrete as to what exactly has been announced at the press conference held earlier today. Until it is announced properly at midnight, we will continue to update this post. Update 4: The episodes are now available on iTunes! The Web Of Fear here. The Enemy of the World here. Update 3: The Independent has published (and then pulled) the story. Of note is the mention of prices (£1.89 per episode or £9.99 per serial) and the comments from Phillip Morris and BBC Worldwide. "Asked whether viewers might also see the recovered episodes, without having to pay Apple £1.89 per episode or £9.99 to download the complete stories, BBC Worldwide said licence-fee payers had already enjoyed a chance to watch the programmes in the late 60s." Phillip Morris couldn't be at the event so he left the message "I cannot be with you as the search is endless. My work must continue." You can see the full article in the hastily put together image to the right or on Google Cache here. Update 2: BBC Worldwide have pulled the DVD-quality Loose Cannon reconstructions for Enemy of the World and The Web Of Fear from YouTube. Update 1: The Northern Echo just posted an apology note about the broken embargo mistake, with a phone call from BBCWW helping seal the articles fate tonight, not due to "inconsistencies" as has been mentioned already. Some more credit to the accidental leak? 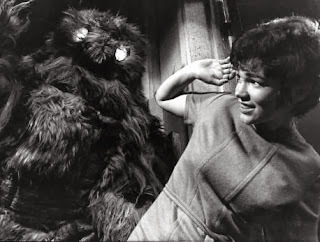 FOUR decades ago, Dr Who's encounter with the mythical Yeti left a generation of children terrified and enthralled. The six part serial Web of Fear became one of the best-loved serials of the Patrick Troughton era. Sadly, in the 1970s the well-travelled time lord faced an enemy far deadlier than the Daleks - BBC beancounters. In an effort to save money, tapes of classic shows were wiped and recorded over. In a matter of months some of the Doctor's greatest adventures were lost... seemingly forever. The Web of Fear is one of the most missed serials, along with another Troughton era adventure, The Power of the Daleks. But now all six missing episodes have been found - in a dusty storeroom in Nigeria. The stories, The Enemy Of The World (1967) and The Web Of Fear (1968) and both starring Patrick Troughton as the second Doctor, have now been remastered by BBC Worldwide, the corporation’s commercial arm. Mr Morris said: ‘‘I remember wiping the dust off the masking tape on the canisters and my heart missed a beat as I saw the words Doctor Who. When I read the story code, I realised I’d found something pretty special.’’ Only one episode of The Enemy Of The World - which featured Deborah Watling as companion Victoria and Frazer Hines, later to find fame in Emmerdale as Jamie - had remained in the archives, so the addition of programmes one, two, four, five and six have completed the story. Fiona Eastwood, director of consumer products, BBC Worldwide, said: ‘‘We are thrilled with the recent discovery of The Web Of Fear and The Enemy Of The World and we’re very happy to be launching re-mastered versions of these treasured episodes to fans as we celebrate the 50th year of Doctor Who.’’ The BBC still had the first edition in the Web Of Fear story, and the new finds mean only number three is missing. The tale introduced Nicholas Courtney as Lethbridge-Stewart, who began with the rank of Colonel but later became Brigadier. The missing episode has been recreated using 37 still images which were available and the original audio which survived. Many programmes from the era, along with many classic shows, disappeared as a result of efforts to save space. There are still 27 Doctor Who stories which have not been recovered or for which episodes are missing. The show celebrates its half-century on November 23. Fingers seriously crossed for the Web of Fear. It's a pity that Nick Courtney isn't around to see this. NUTS to Apple. This better be available elsewhere.